It can be difficult for those with hearing loss to effectively communicate on a cell phone. Some wear headphones. Some rely on a speaker phone and others, in despair, opt for texting over calling. Even those without any distinguishable hearing loss can have trouble understanding each word of a cell phone call; communication is even more difficult with hearing loss in the mix. “Verbal communication is one of the most important ways we have to stay connected with each other. People with hearing loss who avoid conversation because it is frustrating run the risk of becoming isolated from friends and loved ones,” says Dr. Marta Becker. Hearing-aid compatibility: When a person wearing a hearing aid converses over a cell phone, the loud speaker on the cell phone is placed against the hearing aid microphone. If you wear a hearing aid, the result can be a buzzing, high-pitched noise similar to a whistle, and interference. Another issue is alignment. Some hearing aid speakers face forward while hearing aid microphones will be off to the side depending on where and how you hold the phone. The result is a degradation of sound. Truncated signals: Cell phones only transmit a portion of the sound spectrum, a range between 300 hertz and 3,400 hertz. However, human speech goes beyond 3,400 hertz. Some high-pitched consonants, like “s” and “sh” do not get transmitted in a normal cell phone call. As a result, less speech information is transmitted, making understanding speech more difficult. Transmission degradation: We’ve all experienced dropped calls, dropped words, and, at times, a whole lot of static on the other end of a cell phone call. Transmission degradation can be worse for those with hearing aids. Get or activate telecoil wireless technology: A telecoil is a small copper coil that was originally used to boost the telephone handset signal. 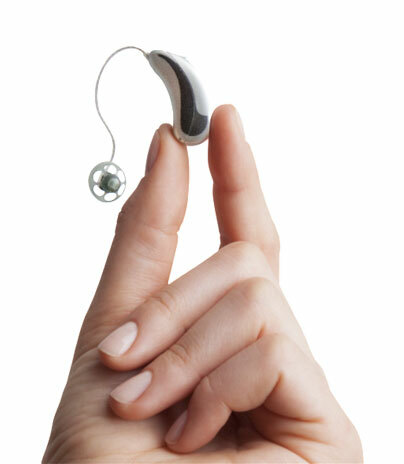 Today, it’s a wireless option on most hearing aids and is also built into cochlear implant processors. The telecoil converts electromagnetic energy from a cell phone into an audio signal that is carried straight into the hearing aid wearer’s ear. It’s basically bridging the gap between two people as they speak on a cell phone while eliminating all or most background noise in the process. Since increasing the volume on a hearing aid doesn’t guarantee improved clarity, the telecoil carries the signal right to the ear and does improve clarity. Some even use it at home while watching television. It allows them to keep the volume on the TV low for the listening comfort of others while they concurrently calibrate a higher volume for themselves with the help of the telecoil. The telecoil also comes in handy at other venues such as auditoriums and churches, many of which are equipped with loops that transmit the wireless audio signal straight to the hearing aid. Although about 70% of all hearing aids today are packaged with a telecoil, don’t assume that yours will come with one. Ask your hearing specialist to include a telecoil with your hearing aid and ask for guidance on how to use it. Buy a hearing aid with Bluetooth-enabled technology: Hearing aids have advanced to the point where they now can accept a wireless signal from a cell phone using Bluetooth technology. Similar to telecoils, sound is directed right into the hearing aid wearer’s ear bypassing the need to carry on conversations from the phone’s loud speaker. Bluetooth also enables you to connect your hearing aid to devices in your home, car or office such as DVD players, MP3 players, computers, and GPS systems. Dr. Marta T. Becker is a Board Certified Otolaryngologist with BergerHenry ENT Specialty Group. She is an attending surgeon at Abington Surgical Center, Blue Bell Surgical Center, Chestnut Hill, Einstein Medical Center Montgomery, Mercy Suburban as well as Roxborough Memorial Hospital. Can’t hear on your cellphone? Here’s help.